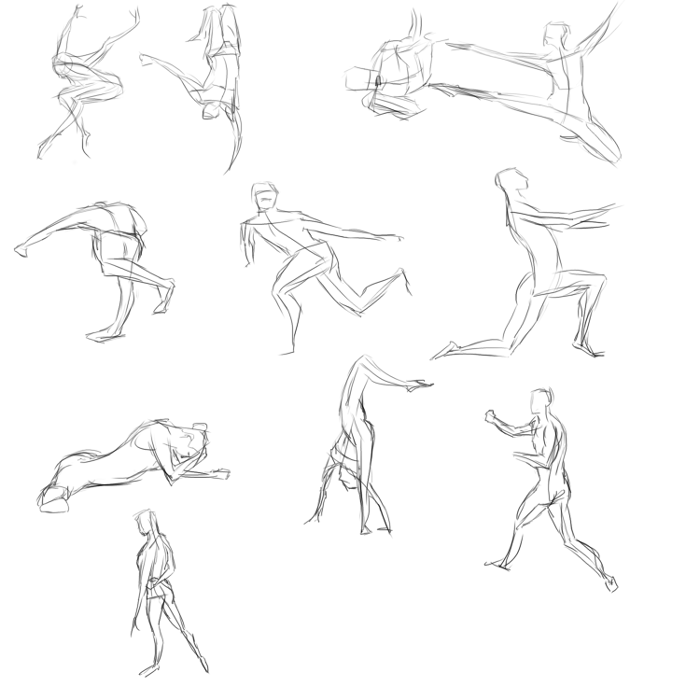 Some more 2 minute gestures as a warm up for tonight. Still trying to use fast, samurai style strokes. Tonight's skeleton trace. 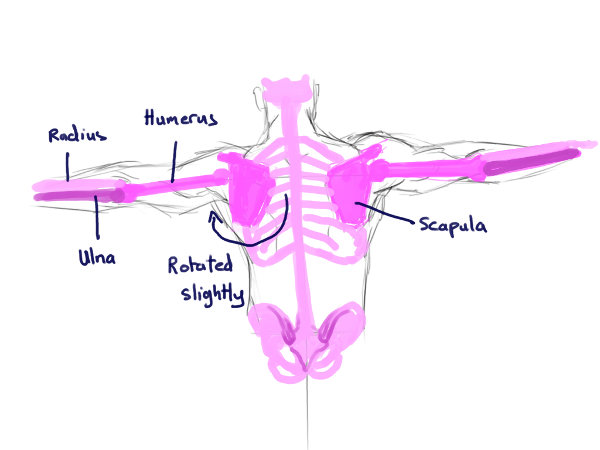 Had to refer to Rogers Peck again and therefore, learned a bit about how the scapula rotates when you raise your arm. 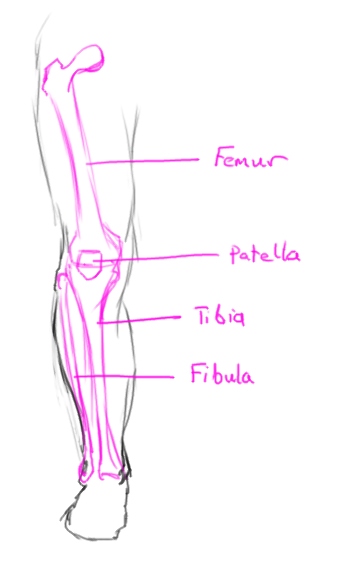 A quick study of the leg bones. The femur is the longest bone in the human body. The top should cause a bulge at the top and side of the thigh. A few sketches from imagination to help me apply what I've learned recently. 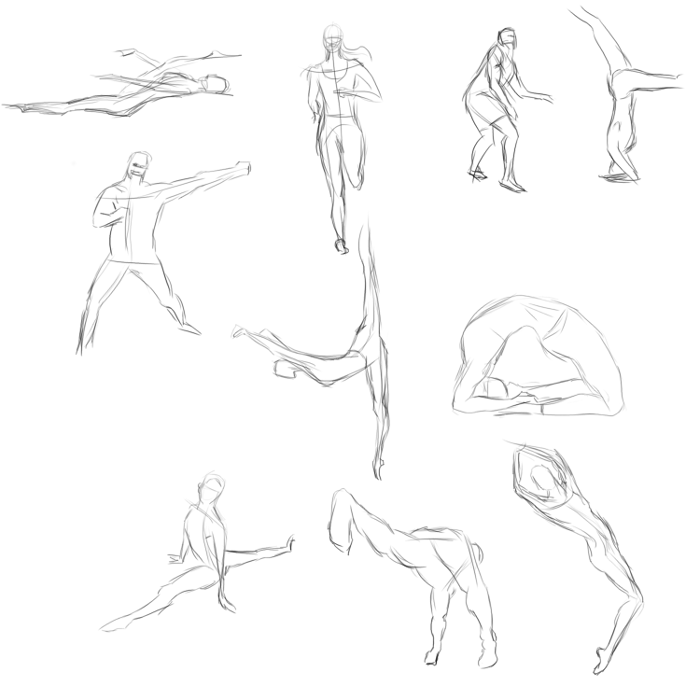 I think the gesture sketching has probably boosted me up most here. Pleasure, thanks for the encouragement YangDaniel027 :). 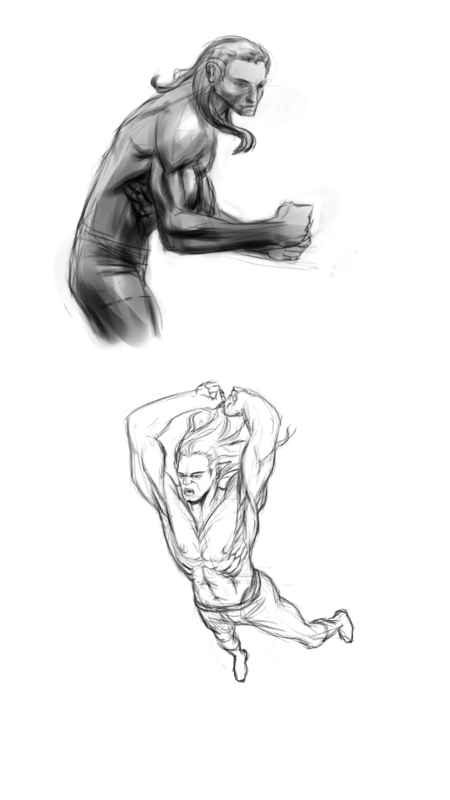 A couple of anatomy sketches from imagination to see if I've learned anything this week. 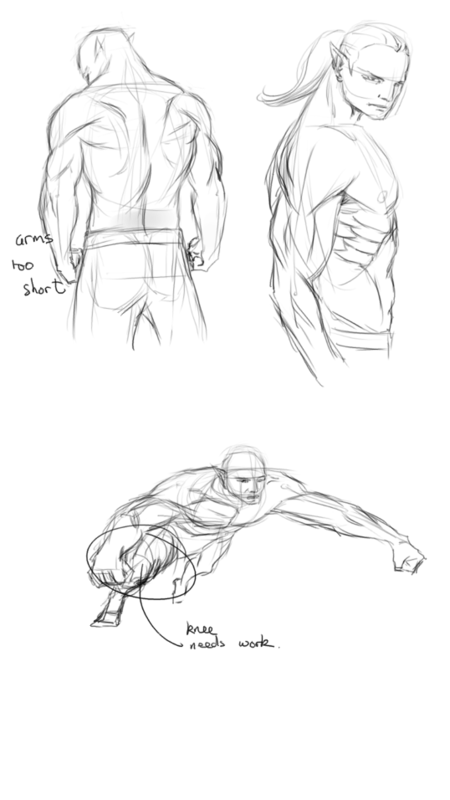 More anatomy stuff from imagination - spotted a few flaws myself in these and scribbled them onto the sketches directly. Need more anatomy study. 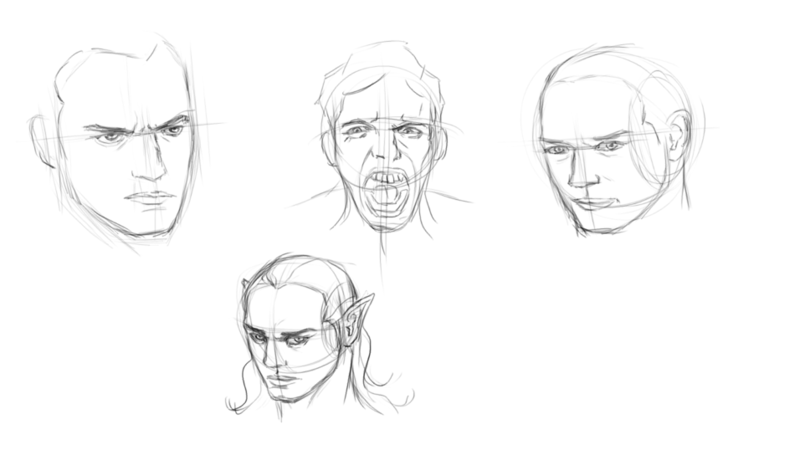 I was also a bit disappointed with my faces so did a few sketches from photo reference. 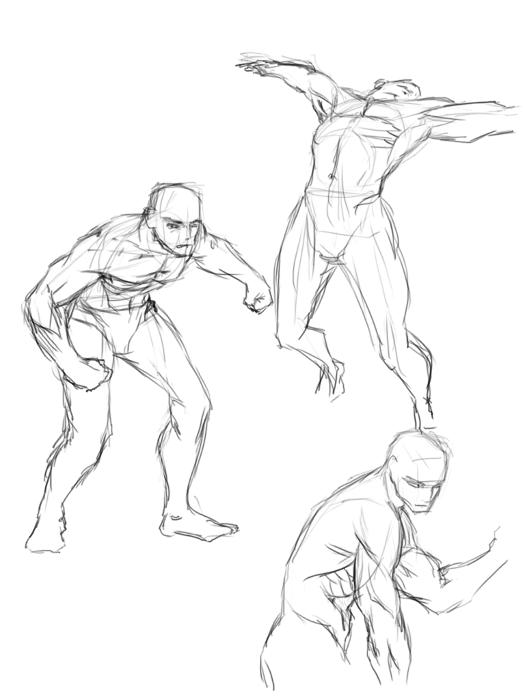 Tonight's 2 minute gestures - still trying to start out with a few construction lines for the spine, shoulders and hips. You know what Artloader? I love your consistency! Nice work on the studies, are you doing digital exclusive atm? (05-16-2016, 07:32 AM)miracoly Wrote: You know what Artloader? I love your consistency! Nice work on the studies, are you doing digital exclusive atm? Thanks Miracoly - currently I'm consistent because I enjoy my current subject matter - characters :). Motivation is key - my trick is to focus for a while on stuff I enjoy and intersperse that with stuff that I find more of a grind. Mostly digital, I do some stuff in a paper sketchbook as well but my phone camera is pants so I don't bother posting that. 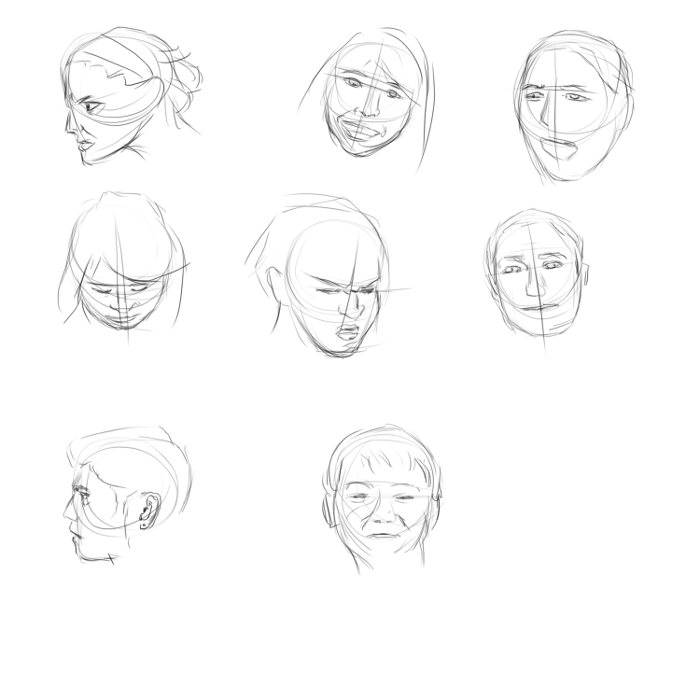 My 2 minute gestures were disastrous tonight - spent too long looking at the references so didn't finish any of 'em! Not gonna bother posting them tonight. 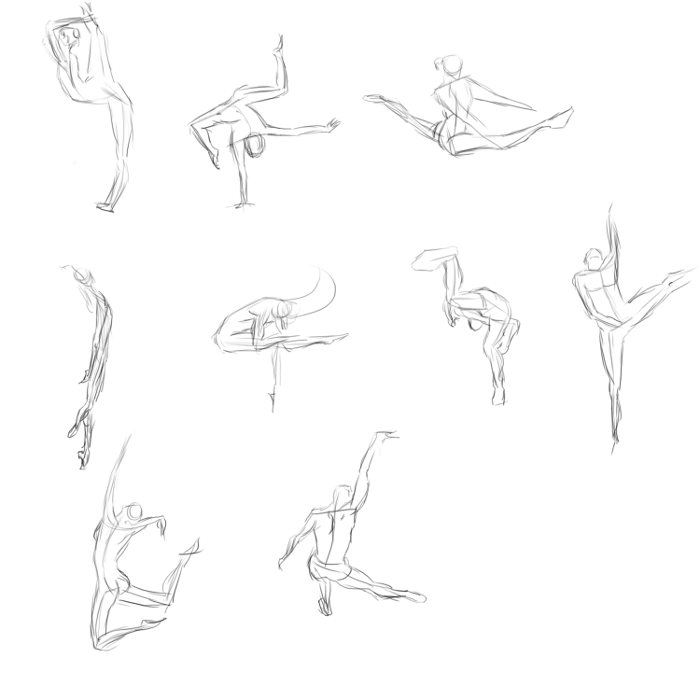 I did a bit less thinking with my 2 minute gestures tonight - just swiped in some shoulder and spine lines and then went for it - managed to get more down tonight. 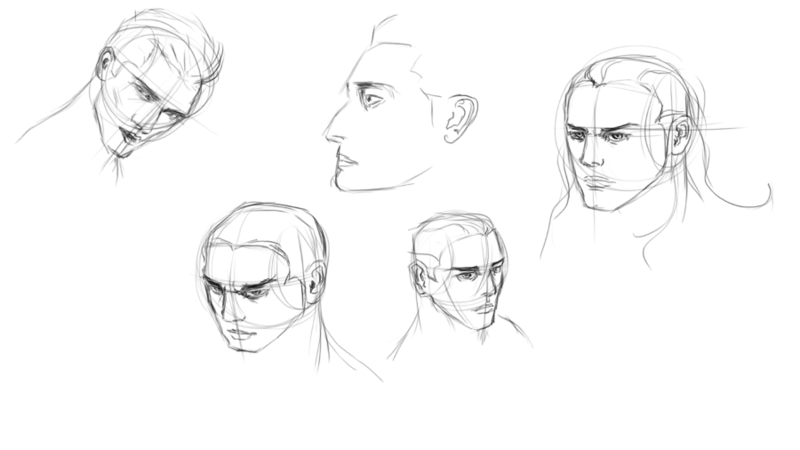 Practicing some more male heads, the first 2 are referenced and the rest are from imagination. 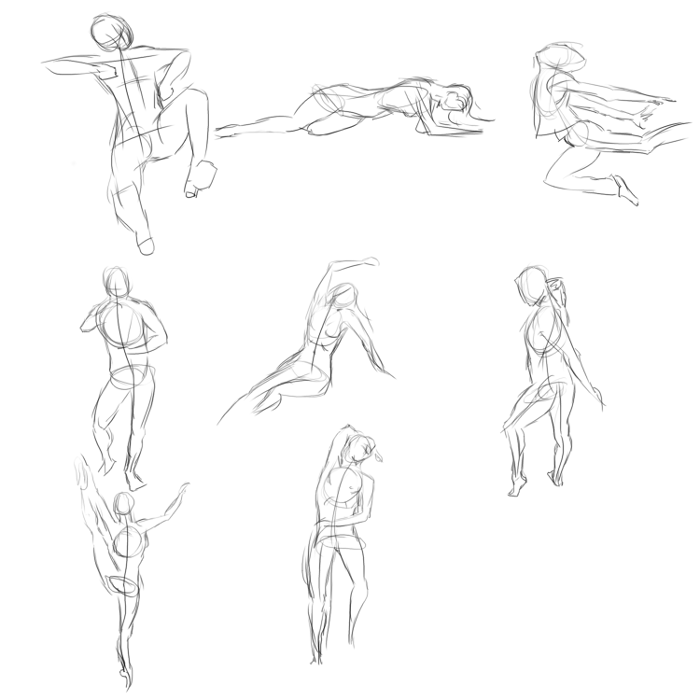 Did some 2 minute poses and 2 minute faces and now I'm catching up on sleep (I found that sleep deprivation is bad for your motivation). 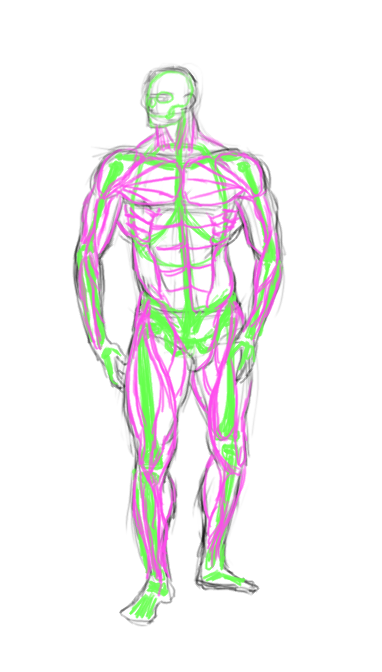 More anatomy study. I sketched a figure from a photo and then sketched in where I thought the bones and muscles were. Had to refer to my Rogers Peck book a couple of times. 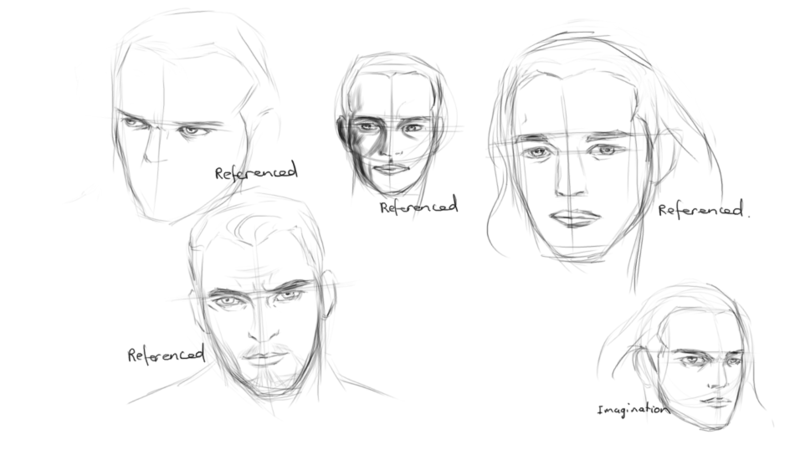 A sketch from imagination to see what I've learned and highlight any gaps still remaining. 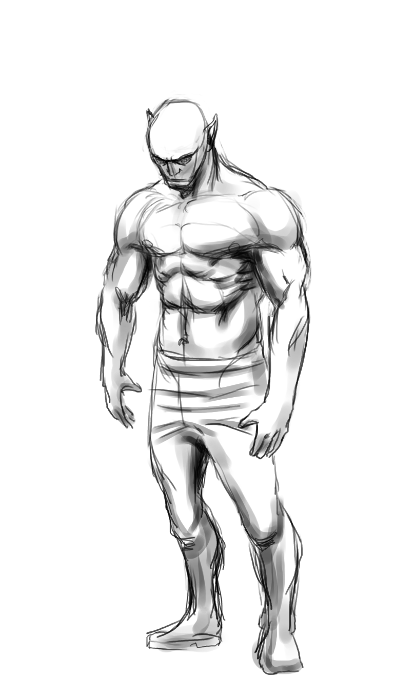 Not too happy with the pose on this one - I wanted his shoulders to be a bit more hunched forward. Also I've got too much muscle definition - I'd like to end up with a more realistic amount of definition. Gives me something to work on I guess :). Hey man, good to find someone else working towards comics too :) it's great that you started focusing on gesture more, for comics and animation it really is the most important skill. 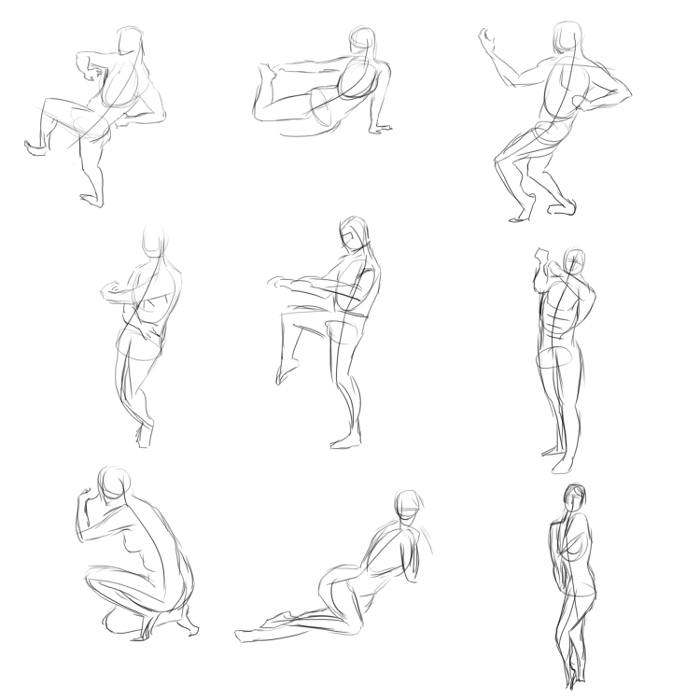 What I found to be a good way is starting a gesture session with 30 second poses, then moving up to 2 min, then ending the session with a couple of 5 min or a 10 min one. By the time you get to those last ones it feels like you have all the time in the world! Missed a couple of nights with the gesture and tonight's 2 min gestures kicked my arse! @JonnyNovice: Wow dude! Thanks for the awesome tips! I will try increasing my time limit for my next session and I followed you all the way up to "wrapping lines" so I thought I'd clarify by giving it a go in the following sketch. Have I got the right idea about wrapping lines on her arms and legs? 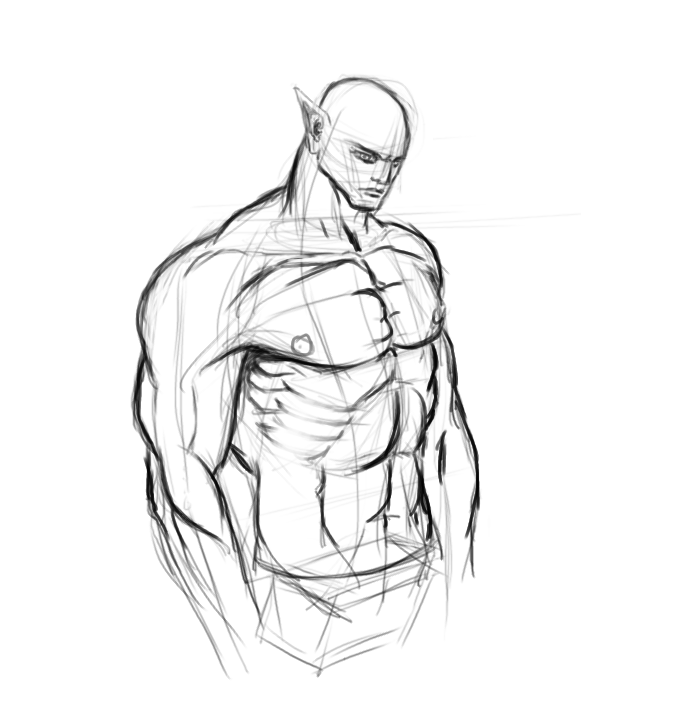 Pressing on with some anatomy work from imagination. I had a theory about where I was going wrong with my last one. 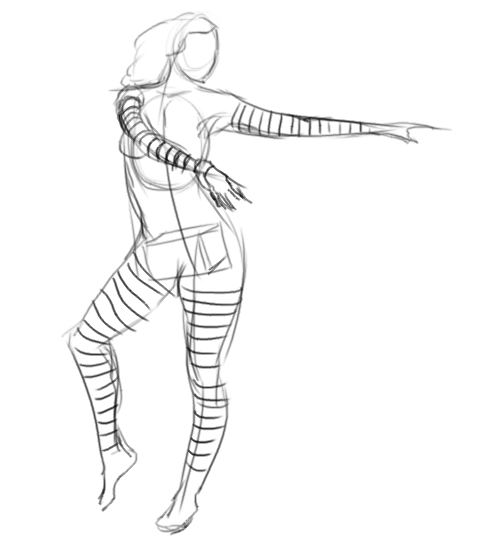 I was too focused on the anatomical components instead of the overall gesture pose. 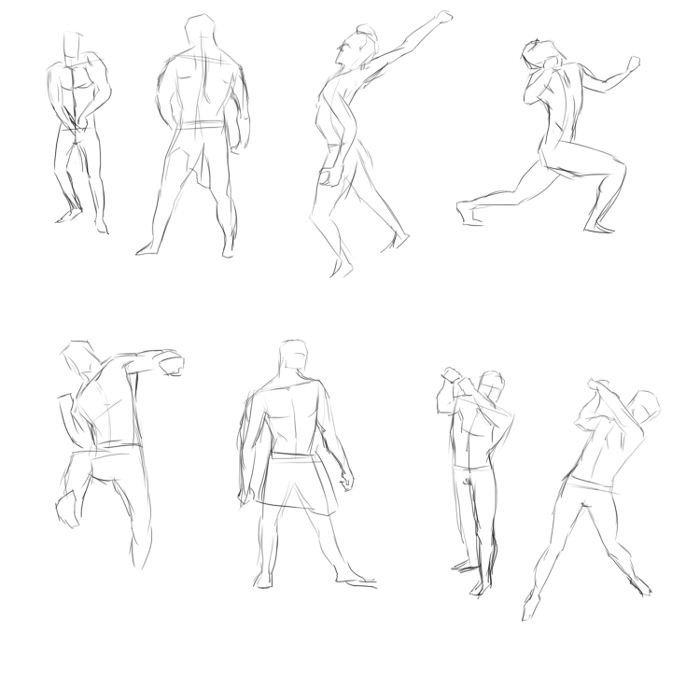 I aiming for natural and fluid figures so my theory is that I should make everything bend to the will of the gesture rather than breaking my gesture with clunky anatomy. Bearing that in mind, here is my imagination piece for tonight. I'm pleased with the pose but I can see that my proportions are a bit off - his legs are too short. More work required!